Black On White [K7068] - $12.00 : Yarn Tree, Your wholesale source for cross stitch supplies. Cross stitch pattern from Courtney Collection. 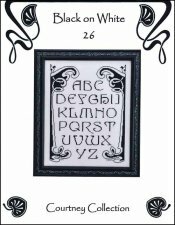 This "Black on White," sampler features the alphabet stitched down the middle with a border on each side of the alphabet. Stitch count 150w x 194h. Stitched on #7457 Zweigart Lugana 28ct. White.